Purple Pershore is well-known and reliable English plum, grown commercially on a small-scale in the vale of Evesham. The fruit is large, and perfect for almost any kind of plum cookery, particularly plum jam. The plums should be picked at the red stage if you are using them for the kitchen, or left on the tree until they are dark purple for eating fresh. Please fill in the details below and we will let you know when Purple Pershore plum trees are back in stock. A good alternative to Purple Pershore if you want to try something different. Purple Pershore is in flowering group 4. Purple Pershore is self-fertile and does not need a pollination partner, although fruiting may be improved if there is a compatible tree of a different variety nearby. 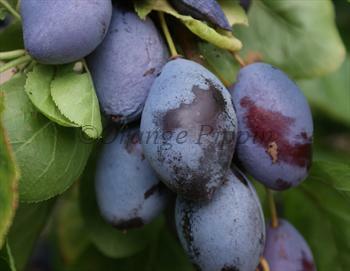 Purple Pershore is an almost foolproof plum variety, self-fertile and with very good disease resistance. It can be grown throughout the UK. The origins of Purple Pershore are uncertain. Some authorities believe it is a purple sport of Yellow Pershore - which it resembles in many ways, apart from the colour. Others believe it may be related to Rivers Early Prolific.